UPDATED: Tue., April 24, 2018, 7:22 p.m.
DALLAS – Southwest Airlines runs its planes hard. They make many short hops and more trips per day than other U.S. airliners, which adds to wear and tear on parts, including the engines. As the investigation into last week’s deadly engine failure continues, Southwest CEO Gary Kelly could face questions about whether the company’s low-cost business model – which puts its planes through frequent takeoffs and landings – is putting passengers at risk. Some aviation safety experts said they see no reason for alarm. And, in fact, Southwest’s safety record is enviable: Until last week, no passenger had died in an accident during its 47-year history. Still, the Dallas-based airline has paid millions over the past decade to settle safety violations, including fines for flying planes that didn’t have required repairs. Twice in the past nine years, holes have torn open in the roofs of Southwest planes in flight. In another episode in 2016, an engine on a Southwest jet blew apart over Florida because of metal fatigue, or wear and tear, hurling debris that struck the fuselage and tail. No one was hurt. Then, last week, one of the engines on Southwest Flight 1380 blew apart at 32,000 feet over Pennsylvania, spraying the Boeing 737 with shrapnel and killing 43-year-old Jennifer Riordan, a mother of two who was blown partway out a broken window. The National Transportation Safety Board said a fan blade that had snapped off the engine was showing signs of metal fatigue. The union representing Southwest mechanics recently accused the company of pressuring maintenance workers to cut corners to keep planes flying. And the Federal Aviation Administration investigated union whistleblower complaints and found mistrust of management so serious that it could hurt safety. In one case, investigators said a worker who should have been praised for finding corrosion on a plane in Dallas was chastised for working beyond the scope of the task he had been assigned. The leader of the Aircraft Mechanics Fraternal Association, Bret Oestreich, said Southwest had created a culture of hostility and retaliation. 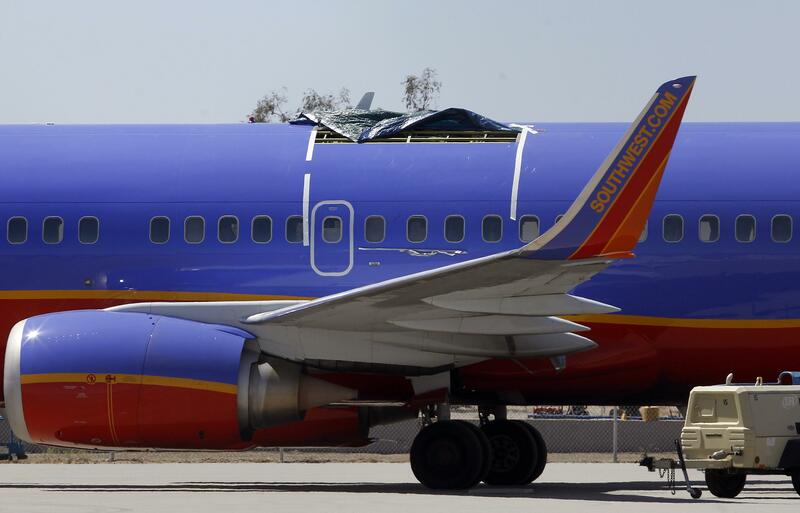 Nevertheless, aviation safety experts and longtime industry watchers said they do not consider Southwest unsafe. “They have had a lot” of incidents, said John Goglia, a former NTSB member, “but you have to remember that they have a very large fleet” – more than 700 Boeing 737s, the largest 737 fleet in the world. Before last week, if Goglia thought about airlines that might have safety questions, Southwest wasn’t even on the radar, he said. Southwest’s short, frequent flights put more stress on the plane and engines, like a car used heavily in stop-and-go city traffic, said Alan Diehl, an aviation-safety consultant and former NTSB and Air Force accident investigator. Diehl said, however, that Southwest’s crews are accustomed to the quicker pace and that their work is made easier because Southwest flies only Boeing 737s instead of an assortment of planes. Southwest jets make on average 5.3 flights per day compared with between 2.8 and 3.4 per day at American Airlines, Delta and United, according to an analysis by industry newsletter Airline Weekly using information from airline data provider Diio. Southwest flies frequently on short routes such as Los Angeles to San Francisco and Dallas to Houston. Its average flight is 764 miles, the shortest among U.S. airlines and barely half as long as the average at American and Delta, according to the Airline Weekly analysis. Each takeoff and landing contributes to wear and tear on the aircraft. “It’s amazing how safe Southwest has been over the years, considering the operational difficulty of what they do,” said Seth Kaplan, managing partner of Airline Weekly. Like others interviewed for this story, Kaplan said he is not afraid to fly Southwest – he and his family are booked on a flight next week. Although last week’s accident was Southwest’s first passenger fatality, it was not the first time someone was killed by one of its planes. In 2005, a Southwest jet skidded off a runway and through a fence at Chicago’s Midway Airport, striking a car and killing a 6-year-old boy. Southwest, the nation’s fourth-biggest airline by passenger traffic but the largest in terms of U.S.-only flights, has paid millions in fines after enforcement actions by the FAA. The biggest FAA fine against Southwest was $7.5 million in 2009. The FAA said Southwest kept 46 planes flying even though they had skipped critical inspections of the fuselage for metal fatigue. Five years later, the FAA proposed a $12 million fine over 44 planes that had undergone improper fuselage repairs while at a contractor hired by Southwest. The airline settled a lawsuit by agreeing to pay $2.8 million. The 2016 engine failure over Florida highlighted the need for closer inspection of engine blades. Southwest spokeswoman Brandy King said that after engine maker CFM International recommended more inspections last year, Southwest had inspected all fan blades covered by the recommendation before last week’s accident. King said the airline will meet a new CFM recommendation to inspect all older fan blades by the end of August. She said the airline is also inspecting all newer fan blades, a move not yet required by the FAA. Southwest’s CEO has said many times before and since last week’s engine failure that safety is paramount at the airline. Rather than hide from bad news, Kelly spoke to reporters just hours after the accident and promised to “do all we can” to help Riordan’s family. The day after the accident, Southwest sent letters from Kelly to passengers on Flight 1380, saying that the airline would give them each $5,000 “to cover any of your immediate financial needs” and a $1,000 travel voucher. Published: April 24, 2018, 5:07 p.m. Updated: April 24, 2018, 7:22 p.m.